Before discovering the UltraRoof380 tiled conservatory roof, Pam and Gary had lived many years with a conservatory that they couldn’t use all year round. Like other traditional conservatory owners they had the problem of it being unpleasantly hot in the summer and too cold in the winter. So the couple decided to transform their conservatory by replacing the old polycarbonate roof with UltraRoof380. What a difference a day makes as the UltraRoof380 tiled conservatory roof installed at Pam and Gary’s home was watertight in just one day, leaving plastering and decorating to continue the very next day. A lightweight tiled roof with slate effect finish and matching guttering, the UltraRoof380 tiled conservatory roof is the perfect choice for homeowners replacing an existing conservatory roof and for home improvers considering an extension. The vaulted plastered ceiling inside is impressive and the thermal performance of the tiled conservatory roof far outweighs the old style polycarbonate and glazed conservatory roof systems. It’s the perfect choice for year-round use; with options to combine tiles with glazed panels, adding down lights and incorporate integrated speaker systems, the possibilities for homeowners are endless. “It’s the room we always wanted it to be,” added Pam. “Now we can sit and enjoy our garden from the comfort of the conservatory, whatever the weather. UltraRoof380 is a cost effective, simple to fit pre- packaged solid roof kit that is perfect for the replacement of tired conservatory roofs. UltraRoof380 substantially overcomes the twin issues of the conservatory being too hot in summer and too cold in winter. Moreover, it creates a beautiful vaulted plastered ceiling inside and with a stepped detail at the eaves the perfect place for cables and spotlights. For those of you who still want an element of light through your new solid roof, the clever configurable technology allows the fitment of multiple glass panels – this can be a major consideration to protect light into the adjacent room. 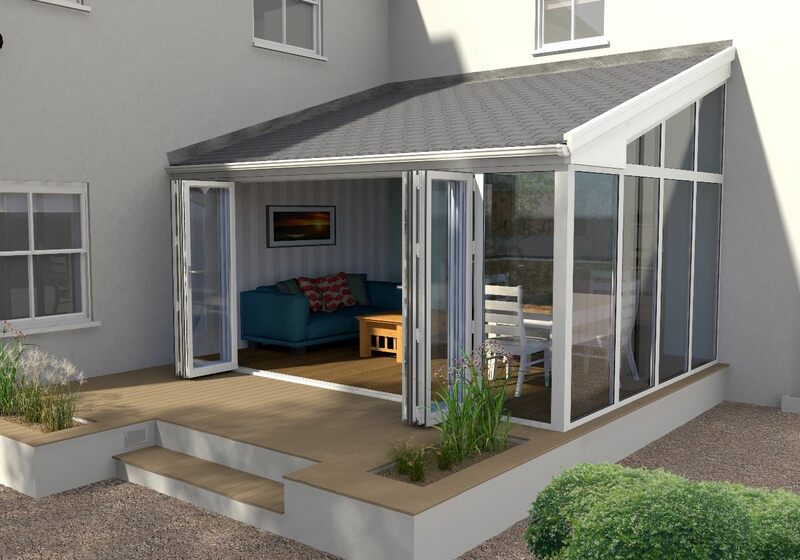 ► On a 4m x 4m Georgian, the system weight is 38kg/M² including plasterboard (12kg/m2 polycarbonate roof and 30kgM² for a glass roof). Call us on 01323 488700 or use our contact form to arrange your free quote.